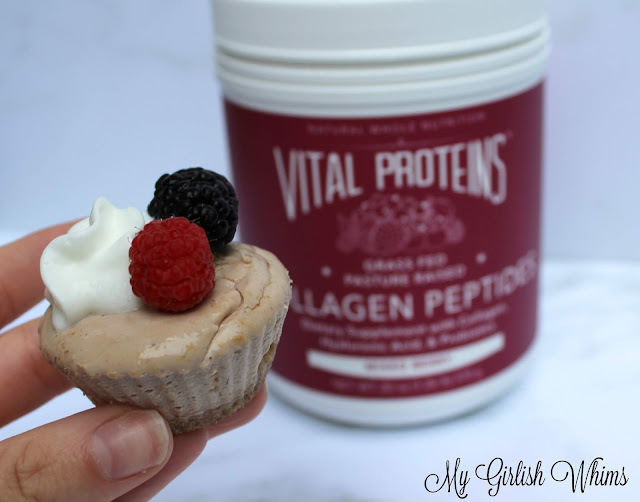 Thank you Vital Proteins for sponsoring this post so I can share the recipe for these healthy and high protein mini mixed berry cheesecakes. I'm a firm believer that A: everything in mini size is more adorable and B: dessert is never optional. 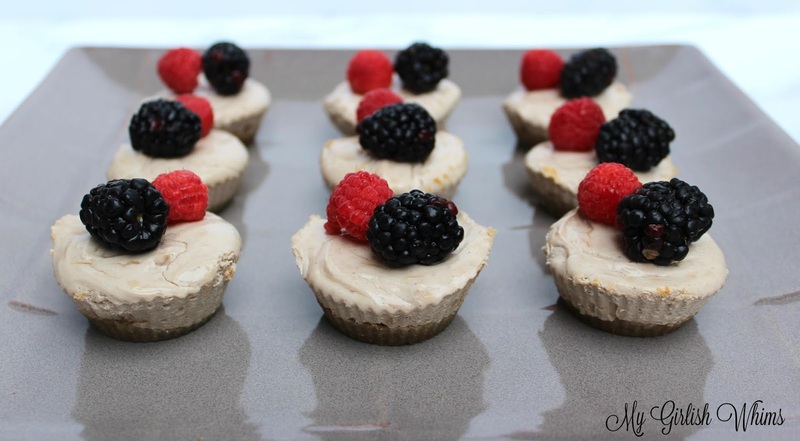 Combine mini WITH dessert in a cheesecake form and now you have a non-optional adorable dessert that you just have to make this summer! These mini mixed berry cheesecakes are made with a vanilla cookie crust and and cheesecake layer that incorporates greek yogurt to keep the fat content low and the protein level high. The cheesecake layer is also berry flavored so I topped each one with a blackberry and raspberry to keep up the theme. 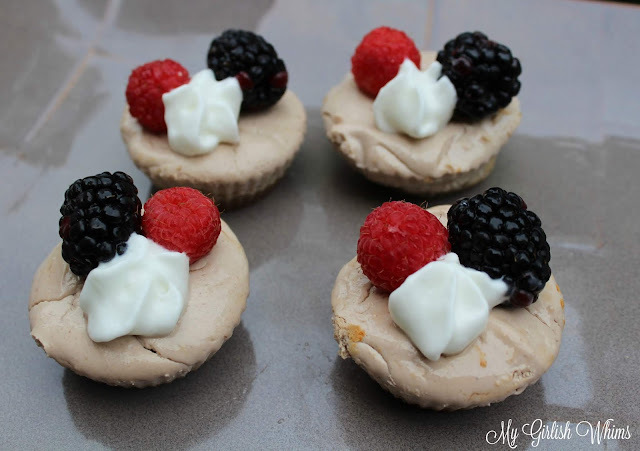 Hit each one with a squirt of whipped cream and now you have a healthy themed dessert ready for the 4th of July! 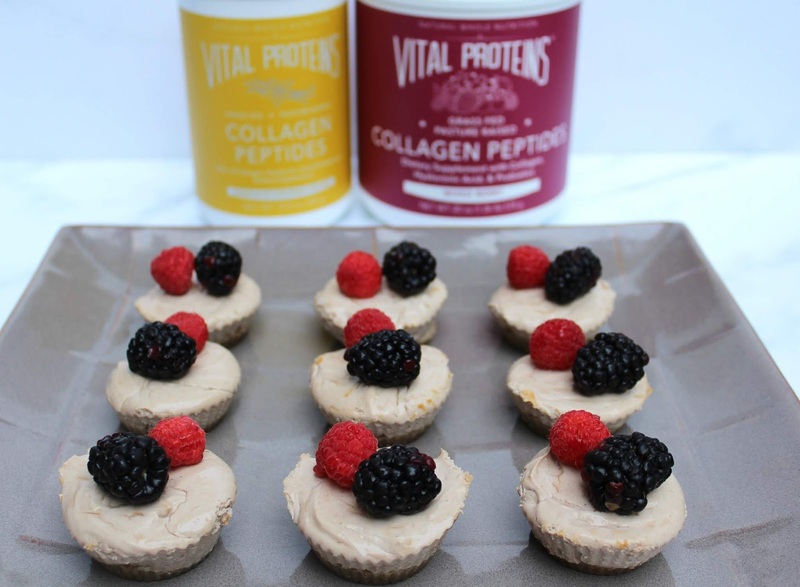 I actually used two different flavors of collagen from Vital Proteins in this recipe to boost up the protein and give this dessert all the added health benefits that collagen aids in including healthier hair, skin and nails and better gut and joint health. 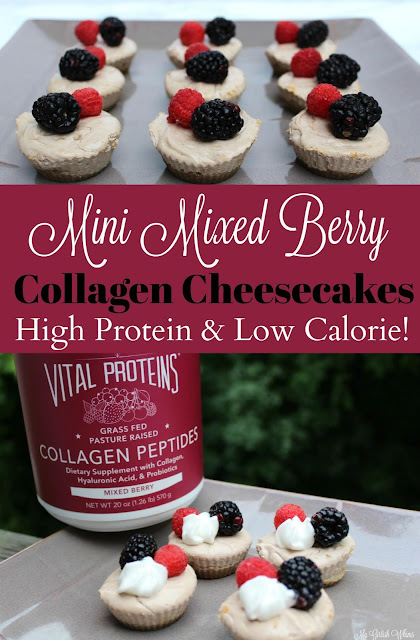 I used vanilla collagen peptides in the crust of the cheesecake and the mixed berry collagen peptides in these cheesecake portion. Both of these versions of collagen peptides are supplemented with hyaluronic acid (also helps promote healthier hair, skin and nails) and probiotics to support better gut health. 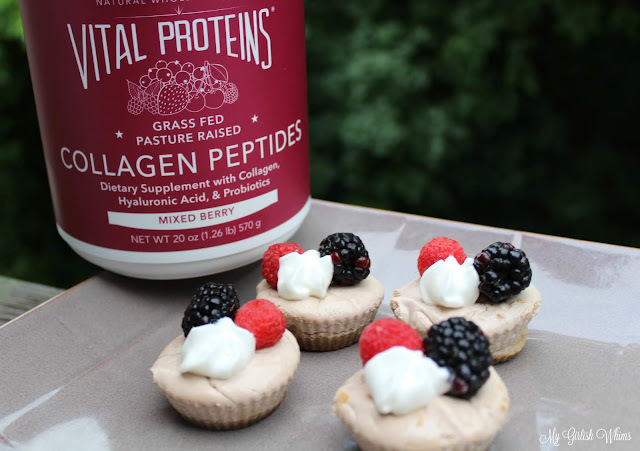 Both versions of these peptides are still only sourced from one ingredient: grass-fed, pasture-raised bovine hides but they are flavored with organic ingredients which adds great added flavor to these mini cheesecakes as well! The best thing about mini desserts is they are also mini in calories! One cheesecake is just over 100 calories but still makes a super satisfying dessert. So good that you can have more than one with no guilt whatsoever! They don't taste "healthy" either: I guarantee if you make them for a 4th of July picnic this year NO ONE will be able to tell that they are made "healthier" than a typical cheesecake. I would plan on making a double batch for sure! This recipe makes 12 mini cheesecakes. One cheesecake (without toppings) is 108 calories with 9 grams of carbs, 5 grams of fat, and 8 grams of protein.